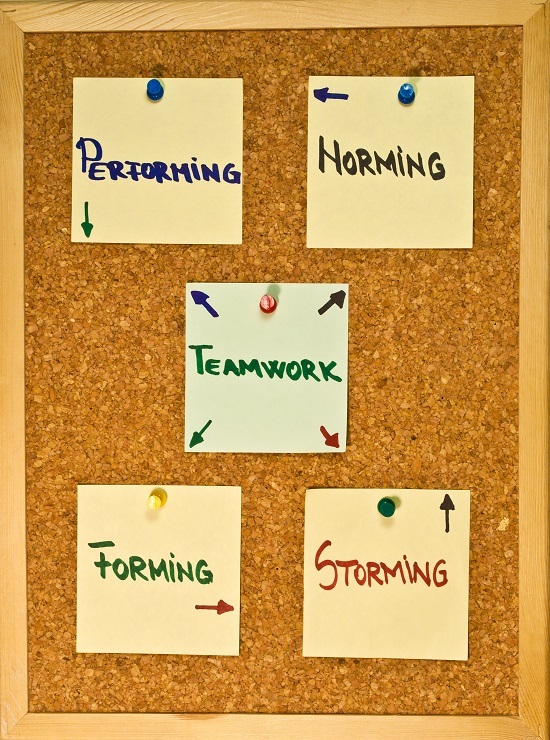 When leading a group, it’s useful to know the four stages of group development: Forming, Storming, Norming, and Performing. When a group first comes together, they are in the Forming stage. It’s a very polite stage when people are beginning to get comfortable with each other. Storming is the next stage, and it can be a little rough, but it’s necessary. When Storming, the group is testing boundaries and figuring out how each person reacts in certain situations. They are also testing the leader’s abilities and authority. If the group determines that they can trust one another to be professional and reliable, then they will move to Norming. The group is working together effectively and beginning to put group goals and professionalism above personal considerations in the Norming stage. Ideally, the group ends up in the Performing stage. At this point, they are a well-oiled machine that accomplishes tasks and goals with ease. The Performing stage is comfortable and fun. The only danger is that if change needs to happen, then the group will resist because they like the way things are! The group doesn’t go through the stages just one time. They start over each time there is a change in personnel or procedure. However, they will usually move quickly back to the stage that they were in before the change. Most groups face change all the time. As a result, they are constantly experiencing the group development cycle. The important question is “How can a leader help the group move through the stages as quickly and painlessly as possible?” The answer is psychological safety. The Storming phase is the most painful and crucial of the four stages. During this stage, the group is testing to see how much psychological safety is present. Can they speak their minds without repercussions? Is it OK to state a different perspective? If they take a risk and fail, what is the result? Leaders can help a group move smoothly through Storming by ensuring the group feels free to disagree with one another and to take reasonable risks. Is that all? How can a leader accomplish that? People work together in groups better when they establish a clear set of behavioral guidelines. In systems coaching, we call the guidelines a Designed Alliance. It’s an agreement among all group members about how they want to interact and solve problems. A Designed Alliance can help a group consciously create the culture that they want and ensure psychological safety. Ground rules created by the leader of the group that are then handed down as mandates are not that effective. The group has not explicitly agreed to abide by those rules. Also, it is then the leader’s responsibility to enforce the rules. The group has little buy-in around rules that they didn’t have a part in creating. It’s more effective for the group to design an alliance together. The group establishes clear guidelines for acceptable behavior and agrees to follow them. The group members also agree to enforce the rules of the Designed Alliance. It’s especially important for the group to determine how it wants to deal with conflict. They agree with the rules and abide by them because they helped to create them! Remember that if you use a rule like “Be respectful,” you need to clearly define what that means. Ask questions like, “Are we being respectful when we are on time, or do we need a separate rule for that?” The Designed Alliance can grow and change over time as challenges come up. It helps the group interact in a positive way that helps them focus on results. We know from Google’s Project Aristotle that results can be extraordinary if psychological safety is present. What atmosphere or culture do we want to create? What would help the group flourish? How would an ideal team handle conflict? What will we commit to for one another? What do we need to feel free to express our opinions? How are we going to handle taking risks? If a group does not experience psychological safety in the Storming phase, then they will move back to a super polite Forming stage forever. The group will not become an effective team. Creating psychological safety and success is ultimately the responsibility of the leader. Group guidelines for behavior are great and usually effective. However, every now and then there is a bully in the group who refuses to play by the group’s rules. It is then up to the leader to call out the behavior. A leader can never stand by and do nothing when a member of the group disrespects another person. If the behavior persists, it becomes a private coaching topic for the bully. A leader cannot allow the behavior to continue under any circumstance because the effectiveness and success of the team depend on the psychological safety of the individuals who comprise the team.